Where are we with electronic prescribing (ePrescribing)? Surescripts’ recently issued National Progress Report for 2017 is helpful in making this assessment. As the unquestioned leader in ePrescribing and related transactions, Surescripts' annual report provides useful data showing much progress has been made and where there is work yet to do as it pertains to physicians transmitting a prescription electronically to a pharmacy and related transactions. This year’s report contains key insights. The Four Phases of ePrescribing. The overarching takeaway is that we’re continuing to make progress but aren’t there yet. In my experience, ePrescribing has evolved in four overlapping phases: adoption, utilization, quality and optimization. Beyond Phases 1 and 2. Beginning in 2005, the industry was focused on encouraging prescribers to adopt stand-alone ePrescribing solutions or electronic health records (EHRs) that have such capability, highly cognizant that the competition was a slip of paper. Sometime after that, it wasn’t about just getting the technology, it was about using it. It’s clear from the Surescripts’ National Progress Report that we’re past these phases. Overall ePrescribing transaction volume grew by 26%. This includes 1.74 billion ePrescriptions, representing 77% of all prescriptions. The other non-electronic prescriptions fall into a couple of categories. There are still providers who refuse to digitize their clinical practice, and the transaction needle won’t move unless they either retire or merge their practices with larger, more modern organizations. Certain types of prescriptions don’t lend themselves to ePrescribing because of unique data requirements. Compound medications, for example, are virtually impossible to ePrescribe using current EHRs. And for specialty medications that require documentation and additional forms, some providers don’t think it makes sense to ePrescribe and then repeat the same information on a form. Standards continue to evolve to accommodate these unique prescriptions as progress continues to inch toward 100%. Moving from Phase 3 into Phase 4. We are now in the third phase (quality) and heading into the fourth (optimization). With regard to quality, for example, Surescripts provided for the first time information about such quality-related transactions as the Structured and Codified Sig. The Sig provides patient instructions in a machine-readable way, thus preventing the possibility of errors that can be made when such instructions are entered manually into the text field and must be interpreted by pharmacy staff. At the same time, there was growth in two optimized ePrescribing transactions: electronic prior authorization (ePA) and real-time benefit checks (RTBCs). 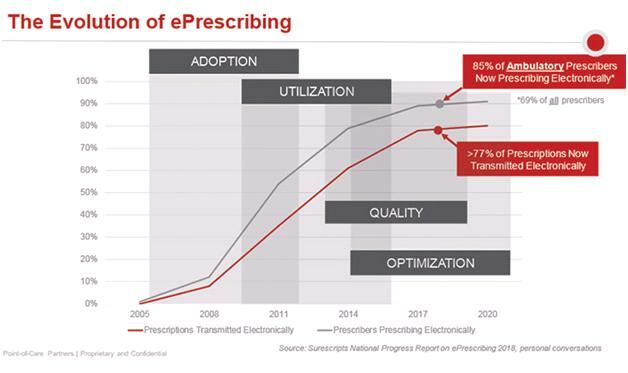 In addition, legislation is driving an uptick in electronic prescribing for controlled substances (EPCS). These developments are discussed below. A 26% growth rate was specifically cited for a combination of five quality-related transactions: drug descriptions, Structured and Codified Sig, potency unit codes, representative national drug codes (NDCs) and RxNorm. Despite the growth, using NDC and RxNorm codes is an EHR “best practice,” but not every ePrescription contains this information. Use of Structured and Codified Sig has not taken off, despite efforts by the federal government to move the adoption needle. Our experience is that prescribers still prefer to write free-form patient instructions in the text field despite the possibility of error and need for pharmacy callbacks. There are two reasons why. First, it takes longer for the prescriber to select each component of the Sig from a list of selections than to type the Sig in free text (not counting, of course, the callback from the pharmacy to clarify an unclear instruction). Despite efforts made by EHRs to improve the Sig selection process, prescribers still find it faster and easier to type in the Sig. The second reason is because most EHR “Sig builders” don’t easily accommodate liquids, injectables, inhalers, compounds and tapered doses. While the Surescripts report notes that use of Structured and Codified Sig doubled in 2017, the increase moves the total from 1% to 2%, leaving plenty of room for improvement. CancelRx is new to the National Progress Report this year and accounted for 3.8 million transactions in 2017. Not widely known, this transaction is primarily used to let pharmacists know that a prescription has been stopped by the prescriber. This leads to more accurate pharmacy records (a good thing) and eliminates unneeded prescriptions from being filled (which saves work for the pharmacy and prevents dispensed, unused medications from diversion). EHRs are required to support CancelRx as part of the EHR Certification Program of the Office of the National Coordinator for Health Information Technology, but providers are not required to use or report on it as part of meaningful use or attestation under requirements promulgated to implement the Merit-Based Incentive Payment System/Medicare Access and CHIP Reauthorization Act. Moreover, pharmacies are not required to support CancelRx. Although it is likely that a mandate ultimately will be put in place, transaction volume growth will continue to be strong even without it. From a public health perspective, it’s a positive sign that utilization of CancelRx is increasing without regulatory requirement. Medication history long has been a core ePrescribing transaction. It has taken on increased importance as an enabler of medication reconciliation and compliance, which are directly related to improvements in quality of care. Some 1.46 billion medication history transactions were delivered in 2017, including approximately 1 million for long-term and post-acute care (LTPAC) facilities. In addition to illustrating growth generally, this also demonstrates improved connectivity of LTPAC. LTPAC has complex workflows, some of which have been challenging to automate. However, their evolution toward digitalization is evidence of the significant growth in this segment — with more to come. Stakeholder groups and vendors recognize this opportunity and are working to address the needs of these digitally underserved markets. Direct clinical messaging is another transaction that can help enhance care quality. It enables the exchange of patient data beyond the traditional ePrescription — putting clinical data directly in the hands of the patient’s care team. For example, it can help physicians share patient information with other providers or assist a specialty pharmacy with receiving payer approval. Last year, clinical messages were sent 25.9 million times by nearly 52,000 clinicians via Surescripts. There are a number of clinical messaging exchanges, often competitors within the same geography. Consolidation of clinical messaging platforms and vendors should be expected as transaction volume increases due to the focus on quality and information exchange by Medicare and other payers. EPCS. EPCS mandates in four states (New York, Minnesota, Connecticut and Maine) continued to drive transaction volume. In 2017, 77.33 million electronic prescriptions were transmitted for controlled substances, increasing from 11% in 2016 to 21%. This mirrors the resulting growth in ePrescribing of noncontrolled substances when regulatory mandate overcame resistance to change — in the case of EPCS, to two-factor authentication — and workflow integration challenges. EPCS volume will continue its rapid increase as more states pass EPCS legislation in response to the opioid crisis. Beyond the four states with mandates, seven have EPCS laws passed with future effective dates, an eighth state has an EPCS mandate law on the governor’s desk for signature and six others have legislation pending. Significantly, transaction volume may get a huge boost if pending federal legislation is enacted to require EPCS for Medicare Part D prescriptions. If that’s not enough, Walmart just announced it will require ePrescriptions for opioids by 2020. It’s likely that other chains will follow suit, leading to major EPCS volume increases. ePA and RTBC. Optimization also can be shown through the growth of these two previously cited transactions. Individually, they can help improve drug price transparency at the point of prescribing. Together, they help prescribers identify the lowest cost medications that are covered by a patient’s insurance. Drug affordability and rising out-of-pocket (OOP) patient costs are hot topics in health care today. Studies have shown that patients do not follow through on prescriptions they cannot afford, leading to as much as $300 billion annually in unnecessary hospitalizations, emergency department visits and premature deaths. ePA can help prescribers determine if prior approval is needed and apply for authorization at the point of prescribing. ePA utilization has begun to take off — with a 350% increase in transactions in 2017 — showing the need for and usefulness of the transaction. Despite this growth, widespread ePA adoption remains relatively low. Not all providers are aware this capability exists and not all EHRs have integrated ePA into their workflows, despite availability of connectivity from several vendors. The question remains whether providers are broadly concerned with price transparency to make wider use of ePA. The real-time benefit check is the bright, shiny new object in the world of ePrescribing. RTBC data are accessed in real time and directly from the payer, providing accurate and detailed benefit information at the patient level about medication coverage, copays and plan restrictions. There were 3.1 million RTBC transactions in 2017 through Surescripts, and several other vendors also offer RTBC connectivity. The RTBC is needed because the eligibility-informed formulary has proven to be suboptimal in ePrescribing systems. For example, there is incomplete or inaccurate display of preferred status and tier level, a missing or incorrect prior authorization indicator, and benefit information at the plan level, not the patient level. While these issues are being fixed, there is debate over whether the formulary and benefit transaction is needed. Some argue that eligibility-informed formulary is still important because it helps determine whether an RTBC is needed. Because RTBC focuses on price transparency, we expect interest (and transaction volume) to rise in response to federal and state efforts to reform drug pricing and reduce patients’ OOP costs. To be sure, there is a lot happening in the world of ePrescribing.